Less than 3.5. Generally not felt, but recorded Often felt, but rarely causes damage. Under 6.0. At most slight damage to well-designed buildings. 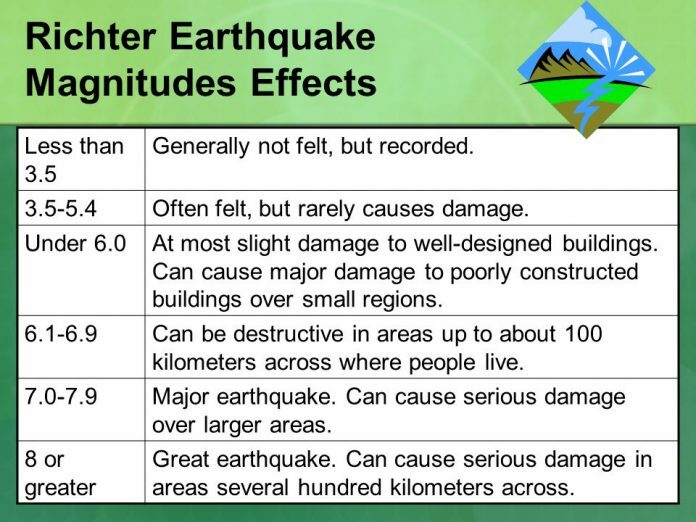 Can cause major damage to poorly constructed buildings over small regions Can be destructive in areas up to about 100 kilometers across where people live Major earthquake. Can cause serious damage over larger areas. 8 or greater. Great earthquake. Can cause serious damage in areas several hundred kilometers across. OCEAN CITY, Md. — An earthquake was reported off the shore of Ocean City, Md. on Tuesday night, according to the United States Geological Survey. Reported around 6:30 p.m., the earthquake was recorded as 4.7 magnitude, 6.2 miles in depth and approximately 136 miles from Ocean City. If earthquakes are strong enough, they can trigger tsunami warnings, but none have been issued in this case. At least 30 people in Maryland, Delaware and Virginia reported feeling the impact of the 4.7 magnitude earthquake, according to the USGS. You may remember a powerful earthquake about seven and a half years ago – Aug 23, 2011 to be exact. It could be felt up and down the Eastern seaboard, and the epicenter was in Mineral, Va. So how does this compare? The 2011 earthquake was a 5.8 magnitude. That means it was 12.589 times bigger and 44.668 times stronger than the earthquake on Thursday. The National Cathedral in Washington, D.C. is still not fully repaired from those shockwaves. It’s been more than seven years and the Cathedral said repair work is only half finished. An earthquake’s magnitude is measured on the Richter scale. It’s “logarithmic,” which means that a one-point increase on the scale is a 10-times increase in magnitude. For context, a 5.0 earthquake is considered moderate.